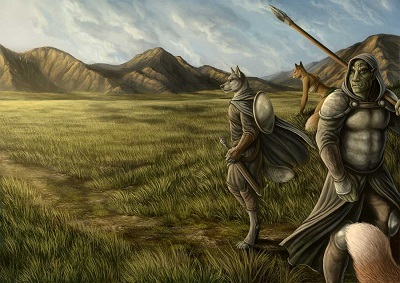 The protagonist of the first two novels is Estin, a “mystery” wilding (the reader will recognize him almost instantly as an anthro ring-tailed lemur, but neither he nor any of the other sentients of his roughly North American Rocky Mountain environment recognize a lemur) caught up in the war between the human nations of Altis and Lantonne, which is interrupted when both are attacked by the Turressian necromancers. Neither Estin nor the reader knows what’s going on except that it is brutal and deadly. Sunset of Lantonne features new characters during the long siege of Lantonne, the largest and most powerful city-state in Eldvar. During the 500+ page novel, it is gradually revealed that the real conflict is centuries older, more complicated, and more fatal than any of the cast had realized. The Northern Approach begins several months after the fall and destruction of Lantonne, with the approximately hundred exhausted and wounded escapees heading north. The escapees have been crudely organized into a group by two who have become uneasy leaders; the wilding Raeln, an anthro wolf warrior, and On’esquin, an orc. Sunset of Lantonne establishes that On’esquin is centuries older than he looks, and knows how the overall conflict really started. Whether his background knowledge is still pertinent is open to question. “Put the man down. Preferably in one piece, Raeln,” warned On’esquin, standing off to one side of the clearing. He had come running out of the woods and was still out of breath as he waited to see what Raeln would do next. Everyone is filthy, exhausted, and starving. Raeln, an almost seven-foot-tall wolf warrior who was proud of his helping the weak, is disgusted by what he has become, and what he may still have to do to ensure the refugees’ survival. “Can we save these people?” he [Raeln] asked, squeezing his eyes shut to hold back tears brought forth by memories best left buried. Like everyone else there, he had lost people, both family and loved ones. His own actions shamed him, thinking of those people who once would have been the first to chide him. The human cities of Eldvar have fallen to the shambling armies of ghouls, zombies, and other rotting corpses controlled by the real enemy. The question now is whether the few ragged escapees can still do anything to save the world from the control of the necromancers. On’esquin knows the ancient prophecies that hint of a chance, but like all prophecies they are maddeningly vague. Who are “the six” needed to foil the necromancers? How are they to do it? If The Northern Approach has a central character, it is Raeln. This is just 12 pages into the 432-page novel. There is bloody swordplay, black sorcery, a new ally, a section that will remind you of Tolkien, ghosts, a human city that has tried to “make a deal” with the necromancers and more. The cover blurb reveals that The Northern Approach merges the action in both Sunset of Lantonne and Into the Desert Wilds, so it is hardly a spoiler to reveal that the lemur wilding Estin becomes an important member of their group. 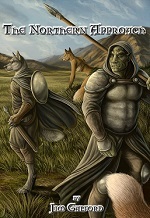 The cover by Rukis shows Raeln, On’esquin and a fox wilding that readers of Into the Desert Wilds may remember. The reader is told from the beginning that The Northern Approach is book 4 of 5, so it is no surprise that it ends with a cliffhanger. It is still a good read for furry fans. Readers of books 1 through 3 will have to get it. If you have not begun The Fall of Eldvar yet, you would do best to start with book 1, In Wilder Lands.